The Colossus of Rhodes is considered to be one of the world's greatest ancient mysteries. It was an iron made statue portrayal of the Greek god Helios and stood about 30 meters tall on an 18 meter tall marble pedestal. Its incredible height made it among the tallest statues in ancient history. The Colossus of Rhodes is considered one of the Ancient Mysteries because it is believed by many researchers to have been situated on the harbor of Mandraki. But some dispute that it stood on top of a hill that was named Monte Smith, which overlooked the port area. When Alexander the Great died, his four generals fought over his empire. Eventually they divided the empire between them equally. One of the generals, named Ptolemy, gained control over Egypt. Rhodes also sided with Ptolemy and formed an alliance, and Rhodes and Ptolemaic Egypt controlled most of the trading in the eastern Mediterranean. When this happened, another general named Antigonus I Monophthalmus became angry at the situation. He and his son, Demetrius, planned to take siege on Rhodes. But, Rhodes was heavily guarded, and all of their attempts with siege towers were foiled. Eventually, Antigonus abandoned the siege, and left most of their equipment and war machines behind. And, to celebrate the victory, the Rhodians sold all of the left behind equipment and used the money to construct a statue of the patron god, Helios. The architect who was in charge of the construction of the Colossal of Rhodes was Chares of Lindos, a Rhodian sculptor whose teacher, Lysippus, constructed the famous statue of Zeus at Tarentum. In 226 BC, only 56 years after the Colossal of Rhodes was constructed, an earthquake struck the city, destroying a significant amount of the city along with the statue of Helios. After it collapsed, many people from all over the world visited Rhodes to view the ruins of the Colossal of Rhodes. It was so massive, that many people couldn't even fit their arms around the fallen thumb. Ptolemy III offered to pay for the reconstruction, but the Rhodians believed that they offended Helios by building the Colossal of Rhodes and that it was he who destroyed one the Ancient Mysteries. One of the most disputed features of the statue is the posture. In many pictures, Helios is depicted with his legs spread, standing on two pedestals at the mouth of the harbor. But, it has been revealed that the Colossus could not have straddles the harbor in such a manner, because the harbor would have needed to be closed until it was finished. Also, engineers have analyzed that the statue would have collapsed from its own weight if it was constructed with the legs apart. The Statue of Liberty in New York, which was a gift from France to the U.S., is based on the posture, design, and dimension of the Colossal of Rhodes. In fact, the Statue of liberty often times called "The New Colossal". There is so much that is still unknown of the Colossal of Rhodes, that it is impossible to come up with a definite conclusion and picture of where it was and what it looked like. 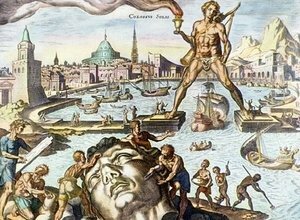 The Colossus of Rhodes is considered to be one of the world's greatest ancient mysteries.